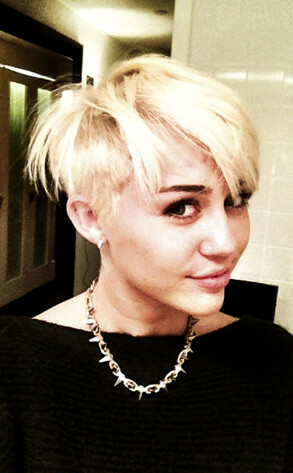 Josie's Juice: Miley Cyrus new cropped haircut - like? Oh, so the blonde bob and platinum colour were just the start of a bigger transformation for pop singer Miley Cyrus, then? Hmmm, not my 'cup of tea'. She posted this new pic on Twitter, with the message: "Never felt more me in my whole life." Oh God, really?? She never felt more her? Really? She never felt more like a butch goth? Please be a hoax. She just ruined herself. What does Chris think? Surely he is drowning his sorrows in Vodka... or something. Me thinks she has gone a little mental a la Brittney Spears. Yeah, Anonymous... I am NOT feeling this AT ALL. As someone on my Facebook blog page pointed out: she will make an elegant bride. Not. There is a story 'out there' in the 'internets' that her hair has broken off as it has been SO chemically treated. Kinda makes sense... but makes even more sense that she'd just been keen on 'rebelling' and looking the part. She wins.